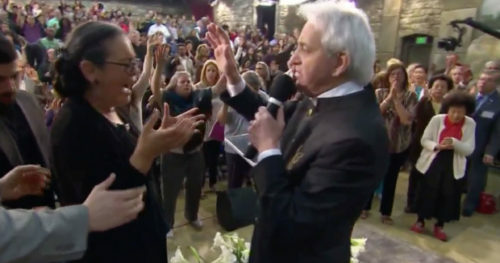 TV evangelist Benny Hinn is going to need a lot more than the laying on of healing hands once the hands of Internal Revenue Service agents finish poring through his books. The IRS and postal service investigators raided Hinn’s office in Grapevine, Texas Wednesday. Hinn was not present and was reported to be out of the country, specifically France. It’s good to be the king, apparently, and religious right watchdog Ole Anthony told WFAA this investigation is long overdue. “There is more fraud in the name of God, not just in America, but in the world, than any other kind of fraud,” said Anthony, who operates the Trinity Foundation. He’s been watching the Trinity Broadcasting Network’s phony faith healers for decades. Hinn announced way back in 1999 that he was building a $30 million healing center in Irving. He raised millions of dollars but the center was never built. “What happened to the money? Same thing that always happens. It goes to meet the needs of Benny and his confidants,” Anthony said. While it would not confirm that Hinn is under investigation for tax evasion and fraud, special agent Michael Moseley told reporters it was executing search warrants and why. “We are primarily investigating Title 26, which is tax evasion and general fraud against the government,” said Moseley.